The Titanium disc is Titanium GR5 and it produced as per ASTM B381. 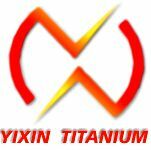 The titanium disc have high quality, it can used in Industrial, Chemical, and Medical. Yixin can produce the titanium disc with OD100~1300mm, target OD is 10~100mm, the High is 10~700mm, or customized size as drawing. Also the Grades of titanium disc are Gr1, Gr2, Gr3, Gr4, Gr5 (Ti-6Al-4V), Gr7, G12, etc. ●Strict inspection when producing and finished products. Visual inspection to check surface quality, ensuring without flaw, black dot and any other defects. 5. In-time mass production delivery. Looking for ideal Titanium Alloy Forged Disc Manufacturer & supplier ? We have a wide selection at great prices to help you get creative. All the ASTM B381 Titanium Disc are quality guaranteed. We are China Origin Factory of GR5 Titanium Target. If you have any question, please feel free to contact us.